The Jaxx Julep kids arm chair has a unique shape and design that makes it a wonderful space for kids to read and relax. You won't have to worry about rough edges because this durable, fun-sized chair is crafted from 100% lightweight, high-density foam and provides countless hours of comfort and support. Plus, it has a handle that makes it super easy for little hands to move and re-position. The microsuede cover is both removable and machine-washable so spills and stains are a breeze to clean up. 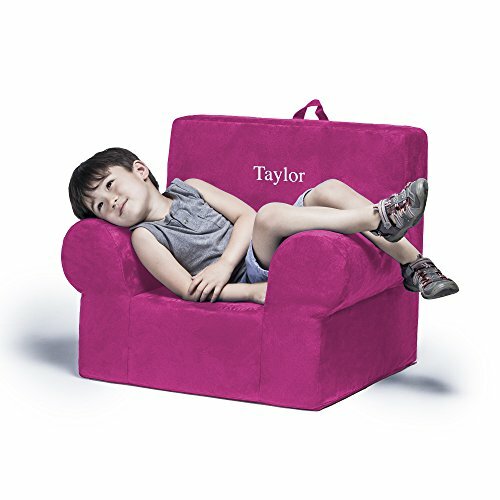 This comfy padded chair delights both boys and girls by giving them a place to relax that is all their own. Each chair can be personalized with up to 9 characters. IMPORTANT: use the "GIFT MESSAGE" at Check-out. Click "this is a gift" in shopping cart, and type the personalization you want embroidered on your Julep chair IN THE GIFT MESSAGE. 9 characters max. in length. Embroidery will be Times font lettering in White Thread as shown in image. Made with pride in the USA (Atlanta, GA). Ships vacuum compressed. Product Dimensions (inches): 20.125"L x 24"W x 20.5"H. Due to personalized embroidery, this item cannot be returned. 1 year manufacturer's warranty. If you have any questions about this product by Jaxx, contact us by completing and submitting the form below. If you are looking for a specif part number, please include it with your message.